The club finally comes together, sort of. What lies ahead is to find a common goal! With Shion joining in and Mimi-sensei as their advisor, the Chorus Club is officially formed! …Except technically, they’re an appreciation society, one step below a true school club in terms of legitimacy. So the Chorus Appreciation Society doesn’t even have access to the music room. On top of that, to keep Shinji in the group, the Chorus Appreciation Society’s members all join his Mountain Castle Appreciation Society…but with one exception: Shion refuses because she doesn’t care about that sort of thing. In order to make everyone happy, two sideline spectators decide to join Shinji: Hasegawa–first name Kozue–and her previously unnamed friend, Katou Kanon. Even the “appreciation society” status is tenuous, so Mimi-sensei suggests that they get some results by entering the MHK Chorus Concours (aka M-Con). While Jin doesn’t really care one way or another about it (there are separate competitions throughout the year, so it’s not like one big tournament, baseball-style), Akira actually does, to everyone’s surprise. He can notice how unpracticed and limited he is, and he wants to improve. His quiet enthusiasm manages to convince everyone else, so they agree to try. The only problem, as Mimi-sensei points out, is that the deadline for submitting songs is today! At last, we have a name! A couple of chapters ago, I had to write about her interactions with the other characters, and I kept having to say “Hasegawa’s friend” and the like while hoping it wouldn’t seem awkward. Thankfully, that’s finally over–and Hasegawa got a first name too! This certainly isn’t the first time that a manga, let alone a Kio Shimoku manga, has withheld character names until later. The bully trio in Eyeshield 21 took forever and a half to get names, and Asada Naoko in Genshiken was known for the longest time as either “Nyaako” or “cat-mouth girl.” At least Kanon got her name revealed in the original manga, and fans didn’t have to suss out Asada’s name in one of the anime’s episode credits! In any case, this probably means Kanon is going to be a more prominent character. Still, I wonder how often are the Kanons of the world are just background characters who happen to fall into more involved roles, and how often that’s planned well in advance. I’m quite fond of the trope where two clubs with insufficient members have to join together to stay alive. It was fun in Chuunibyou demo Koi ga Shitai!, and while a group that discusses mountain castles isn’t as absurd as a napping society, I’m confident Hashikko Ensemble will make it entertaining. I do hope we get to see them visit a castle at some point in the story–maybe as part of a training camp? As for why they have be an Appreciation Societies, it’s rather telling to me that the real reason is basically a transfer of burden. According to the Wood Ensemble Club’s advisor, Ochi-sensei, it took them forever to get that coveted “club” status, so Mimi’s new club should have to go through a similar ordeal. In a way, it’s like an extremely light form of hazing that you’d see elsewhere–earning your place and all that–only applied on a slightly broader scale. Where Do Their Motivations Lie? Jin’s initial rejection of M-Con is one thing, but his reasoning for agreeing provides even more insight into his mind. He cares little for competitions, but the sheer amount of singing a group has to go through to even get ready for one is more or less his idea of paradise. To him, the actual recital portion is just icing on the cake. In other words, here you have a guy who just loves singing for the sake of singing. But on the flipside, I’m not sure how much Akira is motivated by a simple desire to improve and how much he’s being influenced by guilt. As shown in the chapter, Akira still remembers being in middle school and only pretending to sing, and he still feels pretty bad about it. He’s slowly learning to embrace his extremely deep voice thanks to all his singing, but I wonder if he’ll grow to appreciate music and singing all on their own. Continuing from last chapter, Akira and Jin continue to sing “Kanade” by Sukima Switch. While that particular song has been featured multiple times throughout the manga so far, it’s interesting to note the part that’s highlighted in Chapter 12. In other words, the lyrics of “Kanade” pretty much set the theme for all of Hashikko Ensemble. The more I see Kurata Shion, the more I realize that she’s a ponkotsu character–essentially someone who seems capable on the surface but is really a comedic wreck. Just about everything she does in this chapter makes me laugh, from her goofy face while playing piano to her innocently mentioning how lacking Akira’s singing is without realizing how tactless she’s being. Orihara appears in this chapter to talk about how he won’t do any dumb songs (which means he’ll do them if they’re not dumb). When I see him talking, I picture a specific voice in my head: Jotaro from JoJo’s Bizarre Adventure. If ever there’s an anime adaptation of Hashikko Ensemble, I hope they get Ono Daisuke. We’re a couple of months into the winter 2019 anime season, and I was asked by Johnny, one of my Patreon sponsors, for my thoughts thus far. Here are the current highlights, in my view. Based on a popular Shounen Jump thriller/psychological horror manga, it’s very notable that this adaptation is airing during the Noitamina timeslot–a space generally dedicated to appealing to older audiences. While I follow he original comic and thus know many of the spoilers, it’s still an incredible watch. If anything, The Promised Neverland is strong enough to carry the entire season by itself. 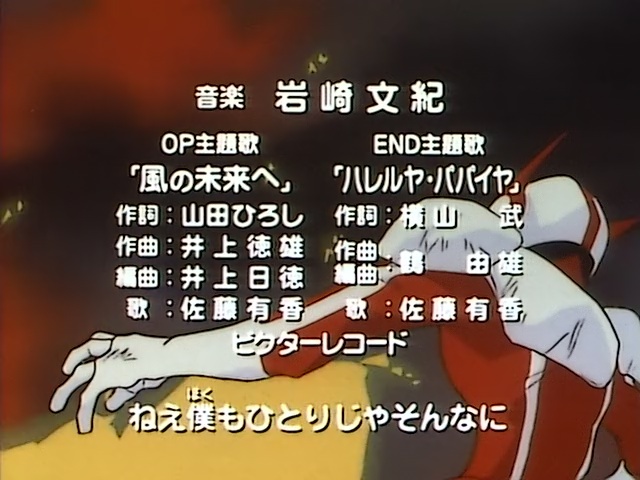 I was surprised to find out that the anime’s director is Kanbe Mamoru, who also directed one of my favorite anime ever, Cosmic Baton Girl Comet-san. Both shows have an amazing sense of almost palpable atmosphere, so maybe it’s not so unusual after all. I recall the 2000 Boogiepop Phantom anime being amazing, but it’s been so long since I watched it that I barely remember what it was about. Thankfully, the current Boogiepop and Others (which is actually a prequel to Boogiepop Phantom) is plenty strong. It’s a bizarre occult mystery series where it feels like each discovery is just one small step in an infinite void of darkness. Even the characters themselves have this almost numbing quality that makes you want to sink further in. There are few characters I want to simultaneously know more and less about than Boogiepop. Elite, super-rich schools are a fairly common trope in anime, from Boys Over Flowers to Ouran High School Host Club, and they can be pretty hit or miss. I was pleasantly surprised by Kaguya-sama: Love is War because while it’s pretty much a “will they or won’t they” romcom, the premise is almost backwards compared to expectations. Rather than it being about hopelessly oblivious teens not realizing their own feelings for each other, it’s about two characters who are clearly interested in each other but see romantic confession as a sign of weakness. Thus, they’re constantly playing a game of chicken to see if they can get the other to ask them out first. I like to think of it as like a mirror version of Monthly Girls’ Nozaki-kun. The only thing is that while I’ve enjoyed the episodes I’ve watched, I wonder if the joke might wear itself thin eventually. Adapted from a manga that ran in Monthly Afternoon, Rinshi!! Ekoda-chan is an eccentric series about a single woman living in Tokyo. The anime is made all the more absurd by a Pop Team Epic-esque approach, where each episode is animated and directed by a different staff. The after-episode interviews last a liiittle too long, but it’s almost supplemental so not a big deal. Does this count as a winter 2019 season anime? The year-long franchise always runs on Precure time (starts and ends in February), but I’m going to include it because the series is already awesome. It’s taking a different approach compared to its predecessor, Hugtto! Precure, but I appreciate that. The outer space/aliens theme is a welcome first that I hope they explore in greater detail. The main character, Hoshina Hikaru, fulfills the “energetic and enthusiastic lead” role like so many other central Cures before her while still managing to feel unique. The show is vibrant and fun, and I expect good things from it. So what series have been catching your attention? Which have you stuck with? Let me know in the comments, if you’d like! This post was made possible thanks to Johnny Trovato. If you have any topics you’d like to see on Ogiue Maniax, check out the Patreon. In the world of competitive Super Smash Bros. Melee, there’s an ongoing open debate as to how to keep the game thriving in the long term. What’s the best way to present the game to a larger audience? How do you maintain tournament integrity? What should competition even look like? With a reputation for being fast-paced and technically involved, Melee often attracts a certain audience of thrill seekers, whether as players or as viewers, which is why there’s been a recent movement to potentially ban or restrict certain techniques and perhaps even characters under the pretense that they harm the longevity of the scene. Current arguments are centered around a powerful technique known as “wobbling” and whether or not it should continue to be legal in tournaments. The surrounding discourse is fascinating because of how it reveals the values that are deeply entrenched in Melee and its history, and how they can at times be at odds with each other. For those unfamiliar with wobbling, it’s a maneuver exclusive to the Ice Climbers that takes advantage of their unique “twin-character” properties to virtually guarantee a KO no matter how healthy the opponent is, with few exceptions. While other characters have vaguely similar throws that allow them to rack up tons of damage, nothing in isolation truly compares to the sheer power that wobbling brings to the table. In fighting game terms, it’s essentially an “infinite,” or a move that can be looped potentially forever. There are actually tournament rules already in place to prevent Ice Climbers from just beginning a wobble and running the clock. An argument I see thrown out fairly often is that infinites and guaranteed death combos are generally patched out or removed from games if the developers can help it, which is mostly true. But it’s also not as cut and dry as proponents of this reasoning use. Infinites are only as powerful, unfair, or game-breaking as the game around them allows them to be. Take the 2005 Hokuto no Ken fighting game, where an infinite or 100% damage combo by no means guarantees a character to be top-tier…because almost every character in the game has at least one or two of them. Instead, the game revolves around these absurd, high-damage combos and potential infinites, and become the reason the game has a scene in the first place. Crazy, elaborate combos are accepted as core to the game. Of course, Hokuto no Ken is not Super Smash Bros. Melee, but if one were to go along with the “infinites are removed by developers” stance, this also means examining two points. First, how powerful/game-changing is wobbling in relation to everything else in the game? Second, if developers did actually patch Melee after all these years, would they only remove wobbling, or would other, more beloved aspects of competitive Melee end up on the chopping block as well? The answers to these questions are subjective and speculative, respectively, but the ambiguity of possible answers also speaks to the relationship between the competitive players and the game itself as both a passion and a proving ground. Ice Climbers, even with wobbling, are not considered the best character in the game. Records prove out that the tools of the true elite—Fox, Falco, Marth, Jigglypuff, etc.—outshine theirs. Although those other characters might not have anything as singularly powerful as wobbling, they have a plethora of almost-as-good options. And while a wobble that has been successfully initiated cannot be stopped outside of an input error, top players have developed anti-Ice Climbers strategies that revolve around prevention. Fighting Ice Climbers involves removing or halting the elements that lead to getting wobbled in the first place: avoiding grabs and separating the two Ice Climbers characters from each other. If one is going by dominance as a criteria for banning Ice Climbers or wobbling, it doesn’t apply, excepting the argument that it’s a steep wall for newer players to scale—a soul-crushing experience for those less honed..
Wobbling is most likely unintentional, given that the current Super Smash Bros. Ultimate has actively removed the ability for chain grabs and grab infinites to occur in the first place. However, there are many things about Melee that would likely get removed alongside wobbling if a balance team were given the chance to redo things. For example, certain characters have what’s known as an “invincible ledge dash,” a technique that lets them get up from the ledge and move forward while retaining full invincibility. What makes an invincible ledge dash different from wobbling? The answer in the eyes of many players and fans is execution and effectiveness. Wobbling’s opponents view it as too easy to pull off for the reward it brings, and that it’s potentially antithetical to the community’s general love for difficulty and precision of execution. The same issue has come into play with the Smashbox, a stickless controller meant to be gentler on the hands, whose easier execution is a point of contention for a competitive community that values complexity of physical performance. Therein lies the real heart of the argument for and against wobbling. A vocal dislike of defensive, non-flashy play permeates the Melee community, and you’ll find fans tying the health of the game to the high-octane excitement it can generate. This is why the argument against wobbling somehow began to drag in the topic of Jigglypuff, the chosen character of current #1 player Juan “Hungrybox” Debiedma, and the very symbol of slow and careful play. It’s the same struggle that boxing has had with Floyd Mayweather’s defensive style or the way Royce Gracie would seemingly “hug” opponents into submission in early UFC bouts. It’s an argument between the two facets facing any competition with an audience: do you prioritize visual flair, or the win-at-all-costs mindset—especially when competitors’ livelihoods are tied to both audience appeal and legitimacy of competition? But What If It Actually Harms the Game? It’s not as if competitive fighting game communities never ban things. In Street Fighter II, or more specifically Super Street Fighter II Turbo, the character of Akuma (Gouki in Japanese) is forbidden. Designed as a hidden, unlockable boss, Akuma comes with advantages that no other character has: invincible limbs (absurd in a game built around punishing arm and leg over-extensions), an air fireball (in a game not built to handle projectiles coming from certain angles), and dizziness immunity, among other perks. Put differently, he countered all of the things that Street Fighter II was built around. He’s such a clear-cut #1 that other characters might as well not exist, and the extreme lack of diversity threatened the life of the game. Even in Hokuto no Ken, where 100% death combos are lauded, there are also a few banned moves. For example, character Rei can perform an infinite rising uppercut to send himself and the opponent into the sky without any ability to fight back. In relation to wobbling, the Street Fighter II example doesn’t really apply. Ice Climbers are nowhere near the being the best or killing variety among character choices, and in fact it’s the other better characters who keep the low tiers of Melee down. As for Hokuto no Ken, there’s arguably a closer parallel with wobbling. Both are infinites and both are relatively easy to execute (at least, if you ask competitive players). However, the fact that there are preventive countermeasures players can practice and implement to mitigate the threat of wobbling, and that wobbling isn’t being done by one of the Top 2 characters in the game (Rei is either the best or second-best in Hokuto no Ken) changes the dynamic. One can learn to defeat wobbling, but it’s more about planning in advance how to avoid the Ice Climbers’ deadly mittens. If we go back to an earlier point—that wobbling is especially harmful to low- to mid-level players—then there is some weight to that statement. It’s only a matter of course that weaker players aren’t as well equipped to defend against such a powerful technique. Does it scare off newer players enough to kill off the pool of new players coming into the Melee scene? Perhaps, but I think it also speaks to the kind of player base Melee tends to attract, i.e. interested in aggressive and flashy gameplay, and the potential failure of the Melee community to encourage its base to accept and appreciate defensive play. If you’ve been wondering where the term “wobbling” comes from, it’s actually named after an Ice Climbers player who popularized the technique: Robert “Wobbles” Wright. However, more impressive than his ability to push the character is his intelligent analyses of gaming and the competitive mindset. On a recent Twitch stream, Wobbles discussed the controversy over wobbling, bringing up a couple salient points. First, he tells the story of a tournament that ended up with a top 3 of all Fox McClouds (the character synonymous with “exciting Melee”), only for the commentators to complain that the more defensive Fox tends to win the mirror matchup. In other words, the pursuit of an “ideal” way to play leads to attacking even that which was once viewed as “acceptable.” Second, he argues that no single character has ever threatened to kill Melee. Instead, the real culprits are stagnation and perception. When wobbling is used to dominate a scene’s perceived heroes, it is regarded with disdain. However, as soon as it’s a villain on the receiving end, fans are eager to cheer for it. Third, he posits that removing wobbling can very well remove Ice Climbers as a viable tournament pick, actually reducing diversity and increasing the risk of stagnation. But in spite of being the technique’s namesake, Wobbles is just one of many voices out there. And while many prominent members have argued against banning wobbling—including players and tournament organizers—it’s more a begrudging acceptance than anything else. “I hate wobbling, but it’d be wrong to see it banned” is a half-spirited defense that I believe speaks to the lack of major figures in the Smash community as a whole who are ready to argue in favor of doing what’s effective, not just what looks good. Compare with the Street Fighter competitive scene, which has had “lame” players practically baked into its essence. On a recent episode of the UltraChen Tuesday Show, Gerald “LA Akira” Abraham recounts the very earliest days of the fighting game community surrounding Street Fighter II in the 1990s, and the fact that one of the best players in the US at the time and a major mentor, Jeff “LA Akuma” Schaefer, is one of the all-time kings of lame play. In this environment, getting past that defensive, minimalist style was practically a rite of passage. Anyone who complained wasn’t strong enough to survive. Following his lead have been big names such as David Sirlin of “Playing to Win” fame and all-time great Justin Wong, who just released a video called “The Art of Lame.” In it, Wong emphasizes the idea that “playing lame” is not intrinsic to any specific character, but a philosophy that can be applied to any character. Street Fighter has had a support structure from practically day one to teach players to accept non-flashy, defensive play—something missing from Melee. While there exist some guides to fighting Ice Climbers and the threat of wobbling, there are remarkably few for what is supposed to be a major problem in the Melee scene. It’s understandable that the kind of preventive counterplay required is harder to teach, and perhaps banning wobbling ends up being the cleaner and easier solution. However, it still doesn’t address the deeper problem, which is that something needs to be done about educating players instead of just feeding into their biased desires for a certain type of “ideal” game they might never reach. The 1990s Brave franchise—most famously known for its swan song, King of Braves Gaogaigar—is a series of children’s anime centered on boy heroes and their heavily merchandisable giant robots. While the overall quality varies, each show indicates a push and pull between being half-hour toy commercials, displaying impressive mecha animation, telling stories that kids enjoy, and imparting important lessons for young viewers. Over the years, I’ve been told multiple times that one of the turning points is 1992’s Brave Fighter of Legend Da Garn: the third entry and first to attempt a more mature and long-form story. Having finally watched it, I can see a more serious yet also a scattershot approach that belies the competing forces dictating the direction of Da Garn. Due to this show’s opening, I once had a very mistaken impression of Seiji. The way he’s drawn and animated in it, there are times when he looks like an adult. It’s almost as if they either hadn’t decided his age, or figured that making him look 6 feet tall and muscular would make for a more exciting intro regardless of how odd it looks. Whatever the case, my expectations had to be modified, though Seiji’s quality voice acting from Matsumoto Rica (best known as Satoshi from Pokemon) helps keep him an endearing if somewhat typical protagonist. There are so many mecha, and they’re given so few opportunities to show their personalities, that only a handful ever get highlighted, leaving many to be less memorable. 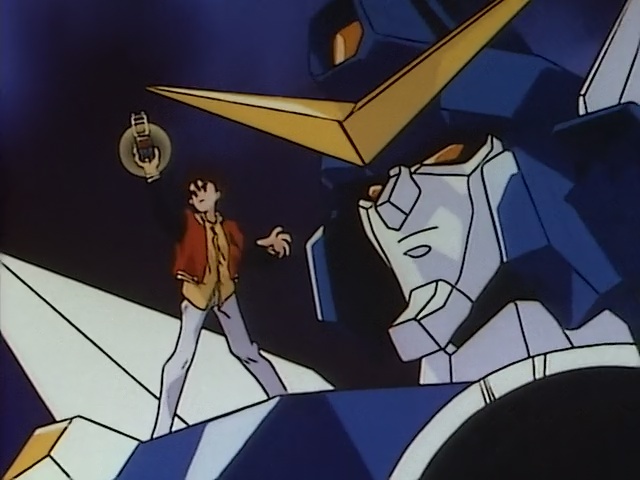 In contrast, it’s hard to forget any of the robots in Brave Police J-Decker or Gaogaigar. Even compared to a series like Girls und Panzer (which also groups a gigantic cast into “squads” with collective personalities), Da Garn can feel sparse in terms of characterization. The main exception to this glut is an antagonistic robot named Seven Changer, who (of course) has seven different forms, and whose cool arrogance is delivered effectively by Koyasu Takehito (Dio in JoJo’s Bizarre Adventure). Speaking of villains, I’m not sure if I’d call them particularly strong, but they are definitely memorable, and they’re explored in great detail. Many of their identifies are initially a mystery, and they’re woven into the simultaneous small-town/global atmosphere in interesting ways. As the series progresses, their stories are increasingly a part of the narrative, and it allows Da Garn to touch upon ideas that would make less sense with Seiji or any of his friends. In fact, I’d argue that the anime doesn’t really find its footing until it starts to do more with its villains. Brave Fighter of Legend Da Garn ends up being the kind of work that is best viewed as taking a step beyond its trappings and its immediate predecessors while still somewhat beholden to them. It’s polished in some areas like visual presentation and general momentum of its narrative, but it sometimes succumbs to the weight of all the different expectations placed upon it. But while it may be outdone by later Brave series, it’s still a joy to experience, quirks and all. This fujoshi is a friend of the manga’s author Mapi Mapi, and goes shopping with her for otaku and non-otaku goods. Once, she tried to make friends with an unseen stranger she heard doing anime karaoke, but forgot to put away her graphic doujinshi first. She is also a fan of Prince of Tennis, including the Prince of Tennis musical. When asked if inserting herself into a doujinshi is okay, she mentions that it’s a big no-no because the character in question should be gay and would never marry a girl.